Huawei Cater Huawei notification error fix Tool is a windows application which allows you to Fix the problem Huawei notification error from various Huawei Smart Phone, In few second in a single click . It's very easy to use. 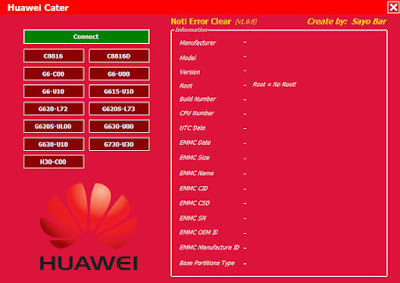 Huawei Error Clear V1.0.0 is a WIndows application.It alows you to repair and fix various Huawei notifications error in huawei smartphones and tablets.Huawei Notification Error V1.0.0 is a application which is created and distributed by “Sayo Bar”.This application allows you to fix the Huawei notification error from various Huawei smartphones and tablets. 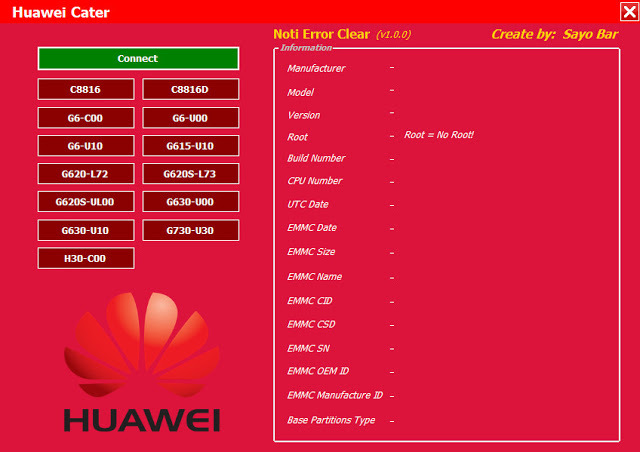 “Huawei Error Clear V1.0.0 is a very useful and helpfull software for huawei smartphone users.It is created and distributed by Sayo Bar.So,full credits go to Sayo Bar.Thanks Sayo Bar for sharing the tool for free.